Call me crazy but I love searching through cookbooks and food blogs to find a recipe that smartly uses up that lonely ingredient sitting in the back of our fridge - this week the last man standing was a package of tempeh. *From 101 Cookbooks, originally from Jude Belerau's book Coming Home to Eat: Wholefood for the Family. On 101 Cookbooks, Heidi cooks it up then tosses the tempeh with leftover wheat berries and kale - which makes sense as she adapted the recipe in January but because it is Spring I wanted to lighten it up and opted for a simple side salad & roasted asparagus. *I'm not into overdoing it on Soy. Tempeh comes in many versions and I used the Wild Rice version here...yumm. Mix the orange juice through garlic in a bowl - set aside. If you want to serve with roasted asparagus (you should!) wash and trim the spears - preheat the oven to 400 and toss the spears with a couple of glugs of olive oil, salt & pepper. Throw in the oven for 15 minutes. Cut up the tempeh into whatever shape you like (I am partial to the traingles) and heat the 2 tbls of olive oil on med/high. Cook tempeh on each side for 5+/- minutes, or until browned. Once browned, pour in sauce and simmer (may have to turn down the heat) for 10 minutes-while it bubbles spoon the sauce over the little nuggets so everything gets covered. The sugars in the orange juice & maple syrup will get thick and shinney! Transfer the tempeh to a serving platter and spoon over extra sauce. 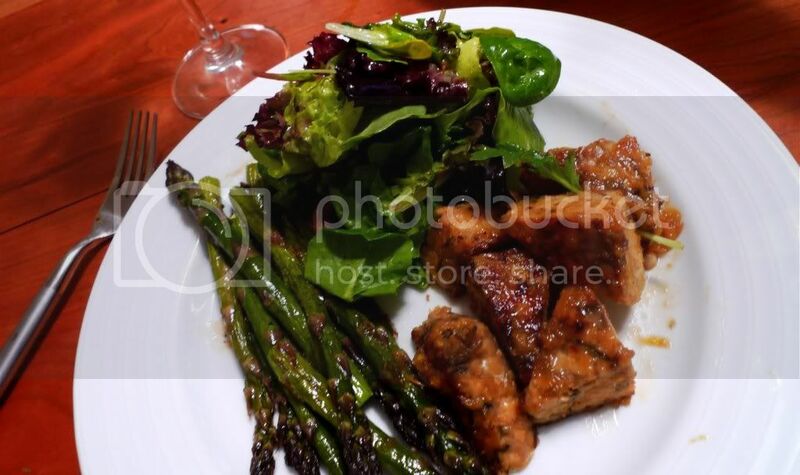 Serve with roasted asparagus and simple mixed green salad.